Steam the buns or place on grill for a few minutes, avoid toasting the buns. Heat oil in skillet over medium heat, turning them or until golden brown. Make pink sauce; mix mayonnaise, ketchup, mustard, lemon juice and soy sauce. Place a hot dog in each bun; add a little lettuce, tomato and onion, and then continue with the sauce. Finally add small avocado pieces and grated cheese. 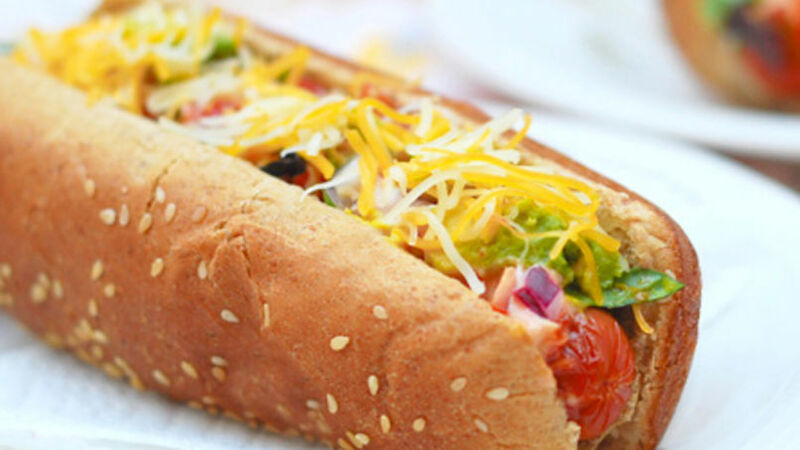 Add everything as desired and be ready to enjoy a delicious Latino-style hot dog! Instead of adding everything to the hot dogs prior to serving them, place small containers with each ingredient on the table so that everyone is free to add what they want. This is a lot of fun for children, too! Having grown up in Venezuela where a hot dog is a work of art and the most basic one has chopped onions, cabbage salad, French fries, three sauces and grated cheese, it only makes sense that I feel like something is missing when I have an American hot dog (with just ketchup, mustard and onions). So when it comes to making hot dogs at home, I like to add Latino-style ingredients and make my own version. Here’s a hot dog recipe that will make you want to combine even more flavors!